First, you need to find a quiet sandbox. 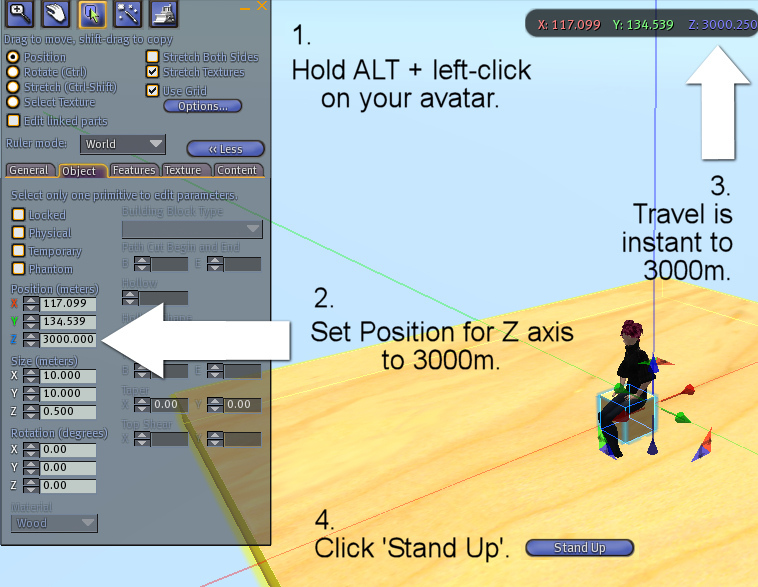 I suggest following this tutorial at a time when Second Life in general and the sandboxes in particular might not be so busy. So if you can get up early in the morning SLT you’ll find a lot less people at the sandboxes than usual. 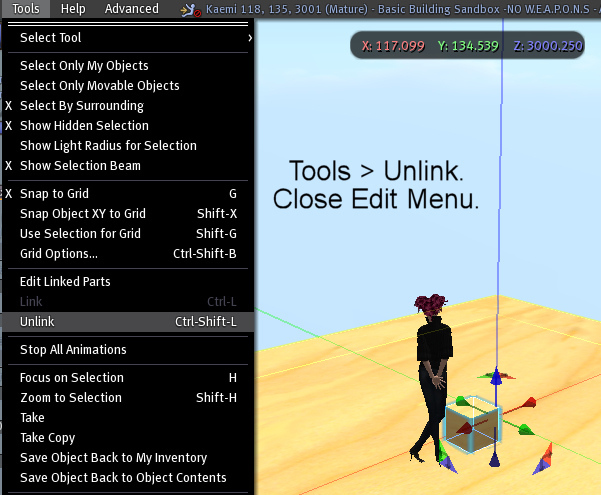 I use Kaemi Sandbox. 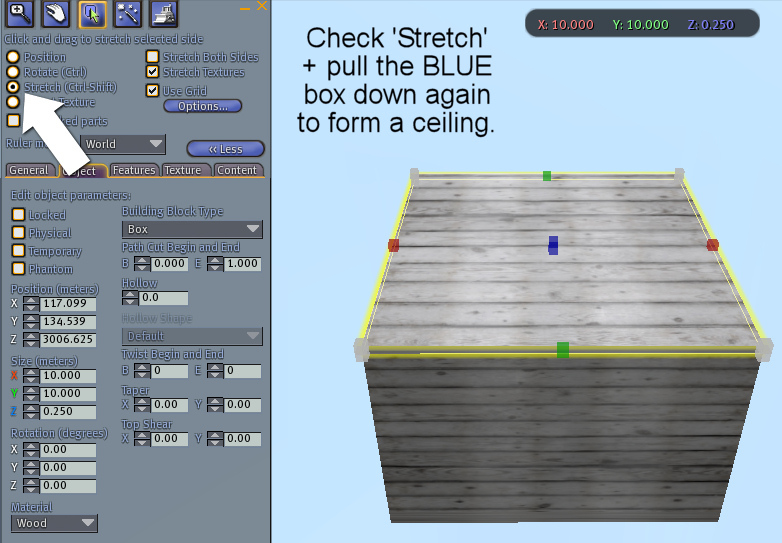 You can also try Skybeam Sandbox. Please be aware that your rezzed items and creations will not stay permanently in any sandbox. 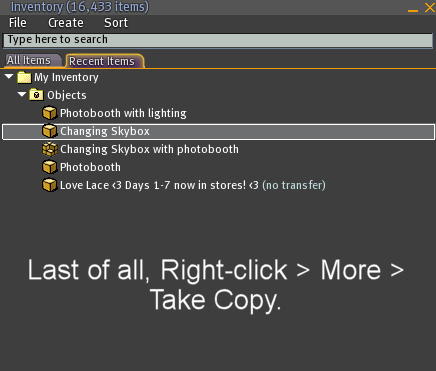 They will eventually be auto-returned to you (you’ll find auto-returned items in your inventory’s Lost and Found folder). The auto-return time could be three hours or more, and you’ll usually find it posted either around the sandbox itself or in its description. I’ve tried to put all the instructive text on the images, to save having to type it all out above them as well. I find this way tends to be much easier to understand. 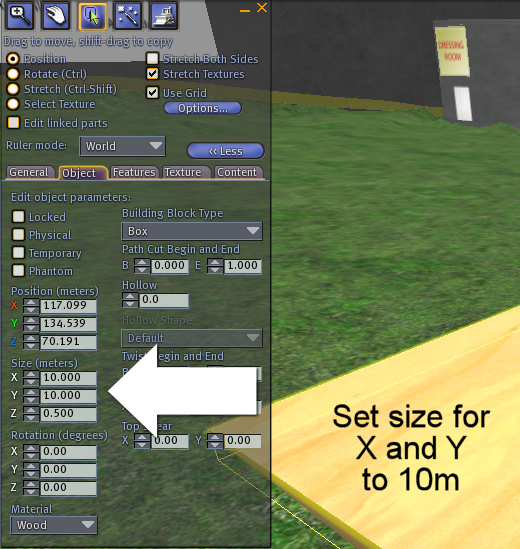 Also, I’ve made this as detailed as I possibly can, so that even a complete novice at building should be able to follow it. So, without further ado, onward! 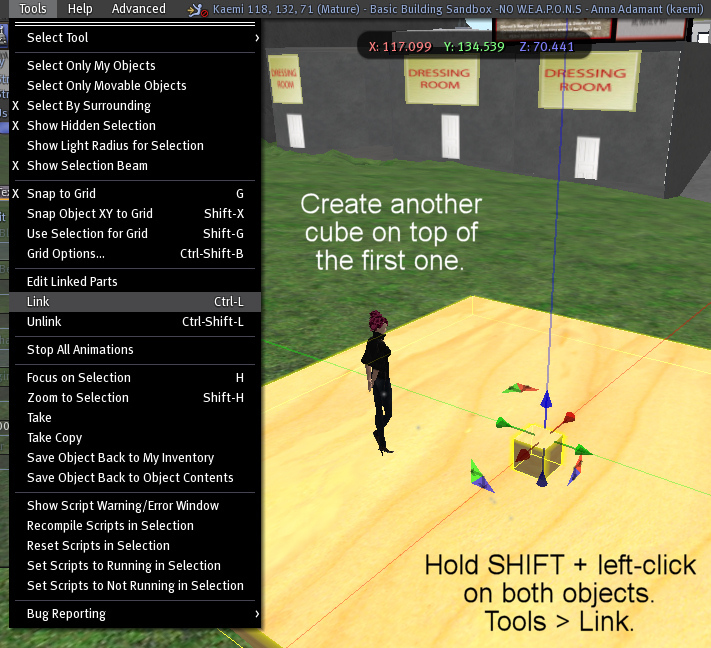 If it’s not automatically available in the menus of your Second Life viewer of choice, the ‘Tools’ menu is accessible by holding CTRL and 3. 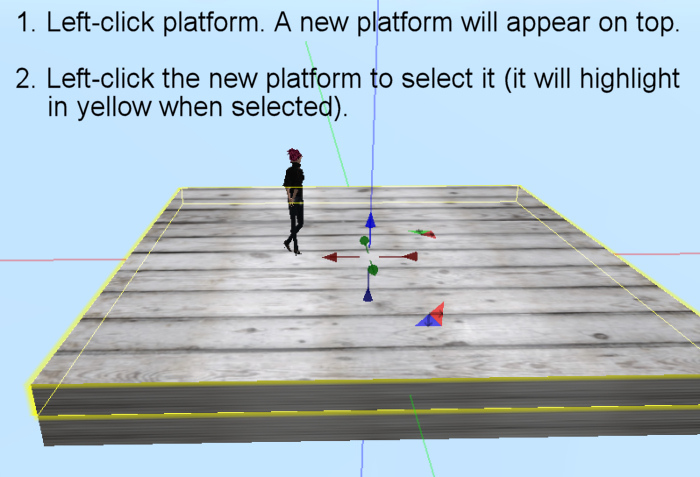 Forgot to put on this next image: you need to left-click the TOP of the platform, since that’s where you want the new platform to be ‘stuck’ to. 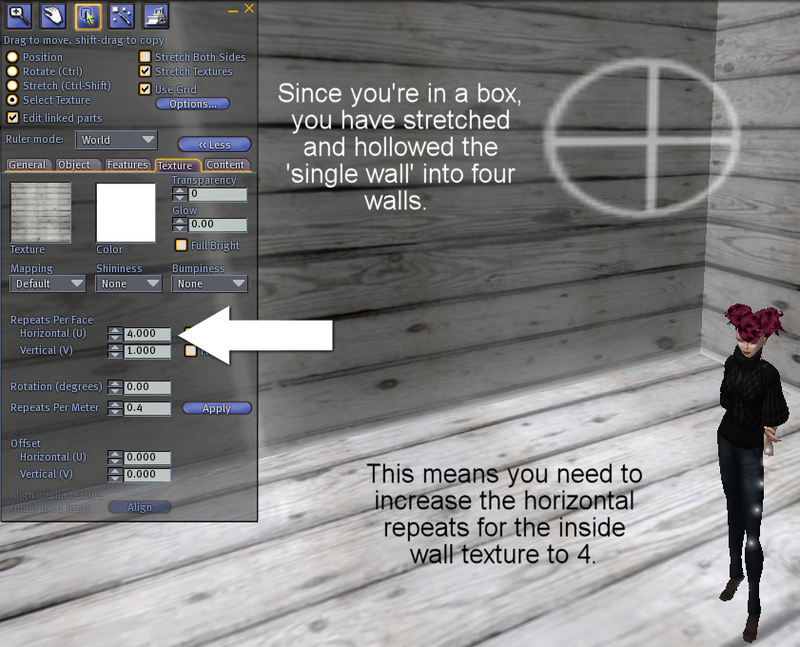 If you didn’t have ‘Stretch Textures’ checked when you made the main walls (and they now look horribly distorted and stretched upwards) then look at the Vertical Texture repeat. You’ll need to set that to one when you set the horizontal ones to four. 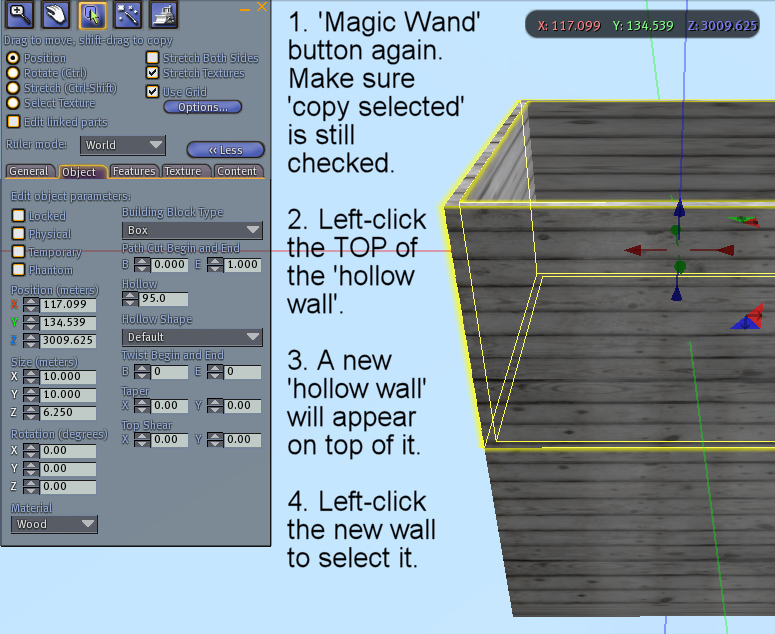 Before you’re completely finished, just edit the skybox again, click that Magic Wand button, and uncheck the Copy Selected box. 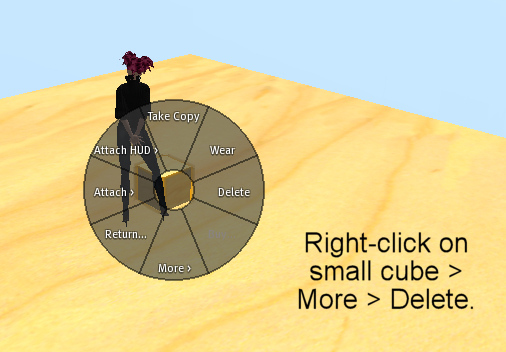 Otherwise, if you started creating more objects, you might end up copying other stuff! And you’re done! 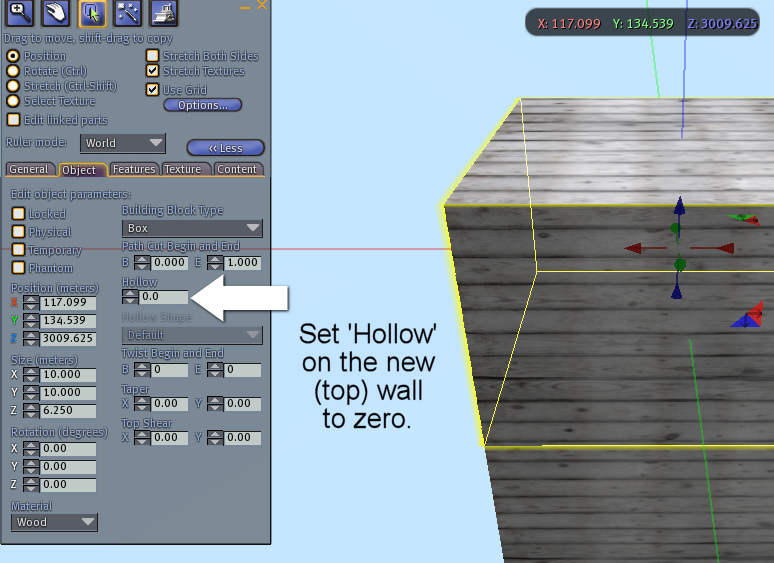 You can now rez this skybox in any sandbox, sit on the cube inside, and set the height to whatever you want, for a private area to open boxes and get changed. 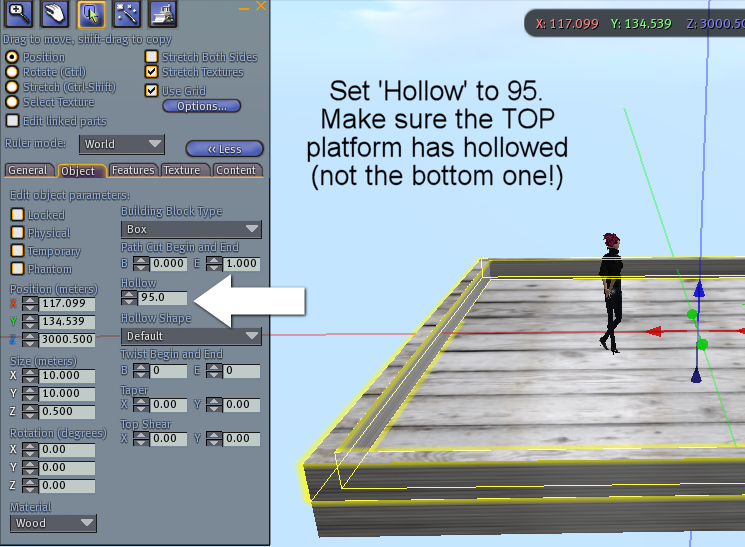 Just find a posing stand (sometimes called an adjustment stand) in your inventory and drag out onto the floor of your skybox, and hop on that if you want to stay still while you change and adjust items. 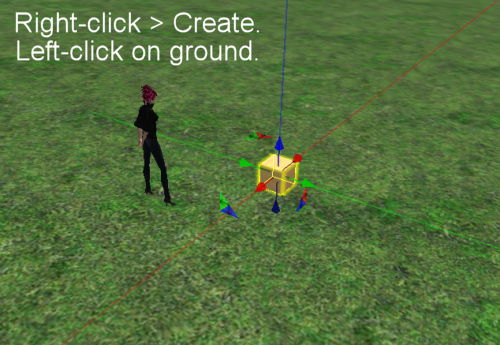 In the next tutorial in this series (already screencapped, but I’m starving and need to cook dinner now!) 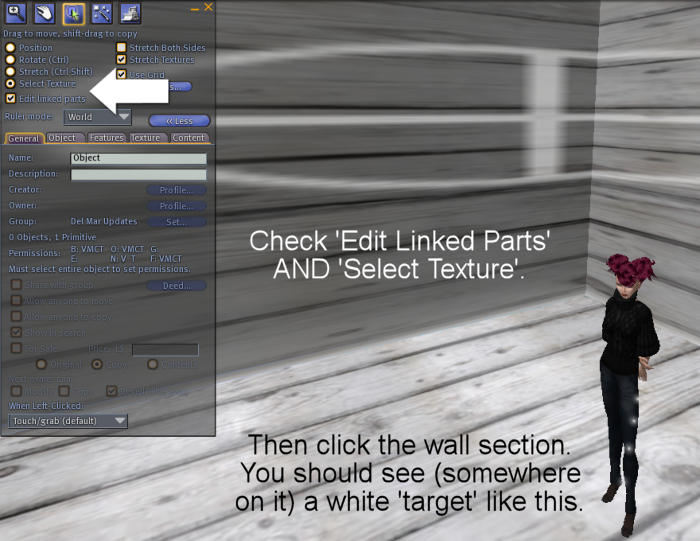 I’ll show you how to make a photobooth with lighting that you can place inside this skybox, so you can take good-quality pics of yourself for blogging, Flickr, or uploading to help you identify what all those outfits look like! This is great! I had wondered about this if possible but it certainly is! Thank you! You’re very welcome, Lilyana :) Privacy is, unfortunately, an illusion in Second Life at the moment, but I’ve found that very same illusion can be enhanced so you at least feel you have privacy. 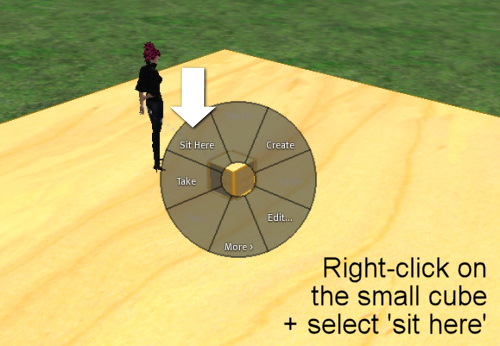 Crystal Gadgets has an excellent skybox rezzer that does basically the same as you show manually… just drop the box somewhere, then sit on it and the rest is popup-menu driven. It’s usually what I use when going through the spoils of hunts. Reuven lLestat of WOndrous Strange has a lovely Moorish skybox for a dollar in her cupid’s arrows hunt thru th end of the month. @ Seasprite – Ooh, thanks for the tip-off! I love Wondrous Strange’s items (bought three bags from the store at Lemania Indigo, which I need to blog about) and I need to finish finding the WS arrows over there! at the max of altitude he not return in your inventer ? @ Louis, I’m not sure what you’re asking here, but if you rez a skybox at any altitude in a sandbox, it will eventually be returned when the sandbox’s auto-return happens. If you’re asking whether the skybox would be returned if you built it as high as possible (4096m) then I don’t know; I never build that high. Sorry I can’t help any further! 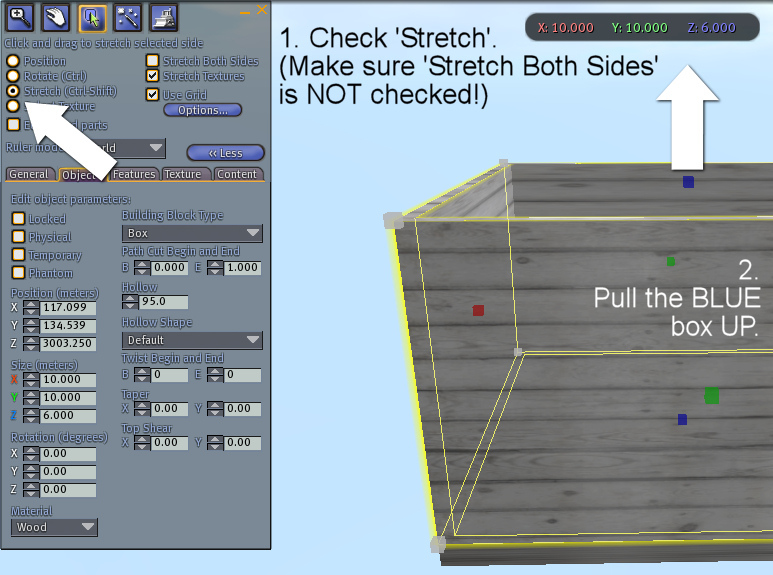 thanks so much for explaining this, i have been having trouble understanding what to do – but your tutorial helped a lot! 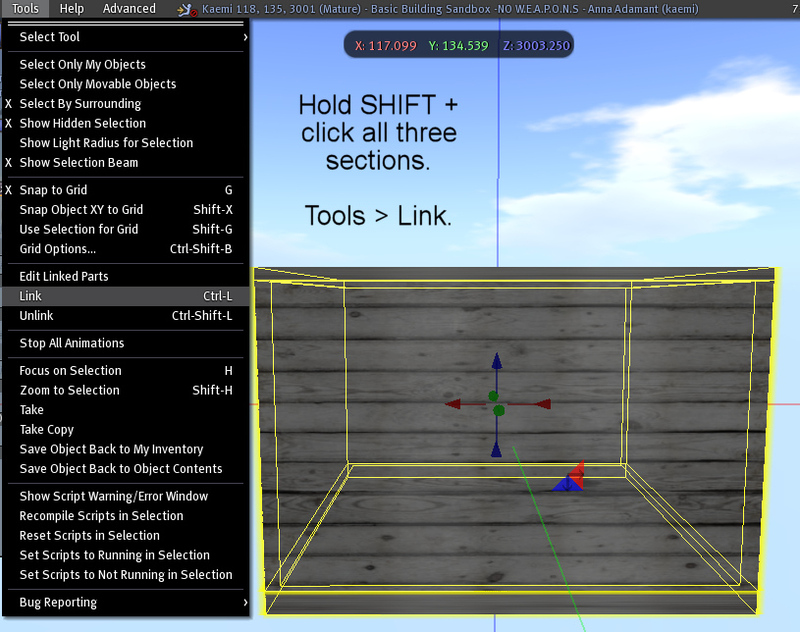 1, the CTRL-L shortcut should still work. 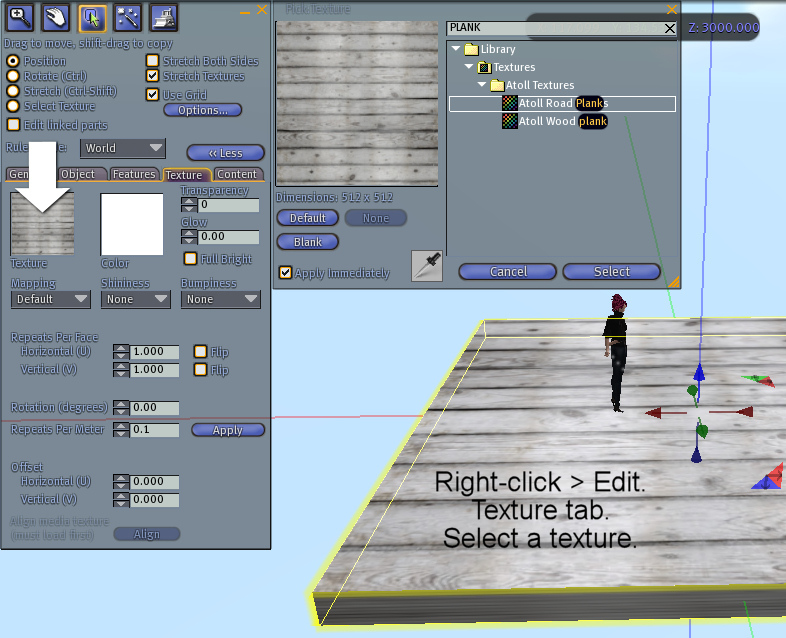 This is an old tutorial, and I’m afraid that I simply don’t have the time to re-do all of my tutorials using V2.